There are several scenarios that can cause messages not to be delivered. This article addresses two such issues. 1. You turned off iMessage with the intent of receiving all messages as SMS text messages and now you are not receiving messages from iPhone users. 2. You have recently switched from an iPhone to some other phone and are not receiving text messages from iPhone users. For this situation, you will be specifically interested in the section at the bottom of this article titled “What If I No Longer Have My iPhone” or go directly to the Apple website to deregister your phone number from iMessage. If iMessage stopped working and you did not make any changes to the iMessage settings, you may want to read this article about not receiving iMessages. Why Would I Turn Off iMessage? Apple’s iMessage service is a nice alternative to regular SMS text messages. It is convenient for sending or receiving messages from an iPad, iPod touch, or a Mac computer that does not support SMS text messaging. When an iMessage is sent to someone with multiple devices, the message is delivered to all devices. However, because iMessage can use cellular data when not connected to Wi-Fi, some folks may opt not to use it on the iPhone. An iMessage is sent using either Wi-Fi or cellular data. When a Wi-Fi network is available, the iMessage is sent over the Wi-Fi connection. When a Wi-Fi network is not available, the iMessage is sent using cellular data. If you regularly approach the monthly limit of your data plan, you may try turning off iMessage to save some cellular data usage. If you open the Settings app on your iPhone, select Messages, and set the iMessage slider to the off position, you will no longer send or receive iMessages on the iPhone. However, depending on your situation, you may end up not receiving text messages from iPhone users. Additionally, if you have multiple Apple devices, the iMessages will still be delivered to your other devices. This is usually not desirable because you want messages sent to your phone number to be delivered to your iPhone. To understand what is happening, let’s take a closer look at iMessage. The iMessages are delivered based on your Apple ID, not your phone number. 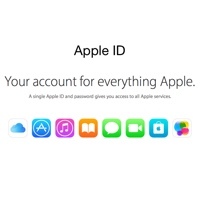 When you initially setup an Apple device, your Apple ID is automatically signed in to the Messages app. When your device is an iPhone, your phone number becomes associated with your Apple ID. When someone with an iPhone sends a message to your phone number, their Messages app communicates with Apple’s servers and finds your phone number associated with an Apple ID. The sender’s Messages app will then send the message as an iMessage. When someone with an iPhone sends a message to someone without an iPhone, the Messages app finds no associated Apple ID and the message is sent as an SMS text message. Turning off the iMessage slider on your iPhone will stop iMessages from being delivered to your iPhone. However, if you have multiple Apple devices, it does not stop iMessages from being sent to your Apple ID. Consider the situation where someone has both an iPhone and an iPad. 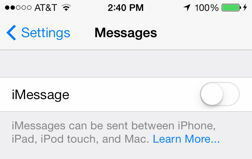 Turning off the iMessage slider on one device will still allow iMessages to be received on the other device. Even with the iMessage slider turned off, your phone number is still associated with your Apple ID. Therefore, when other iPhone users send a message to you, it is sent as an iMessage to your Apple ID. But, since the slider is turned off, the message is not delivered to your iPhone. If you want to turn off iMessage and have all messages delivered to your iPhone as SMS text messages, you need to break the association between your phone number and your Apple ID. Simply turning off the iMessage slider does not break the association. To disassociate your phone number from your Apple ID, first make sure iMessage is completely turned off on your iPhone. Do this by opening the Settings app and selecting Messages -> Send & Receive. Tap your Apple ID at the top of the window and select Sign Out. Once you are signed out, make sure the iMessage slider is set to the off position (no green is visible on the slider). This will typically disassociate your phone number from your Apple ID. However, if the problem still persists, go to https://appleid.apple.com and change your Apple ID password. By changing your Apple ID password, you effectively deauthorize your iPhone from using Apple’s services until it can re-authenticate with the correct password. With the iMessage service deauthorized to your iPhone, Apple’s servers will no longer associate your phone number to your Apple ID. For each service, enter your Apple ID and password when requested. 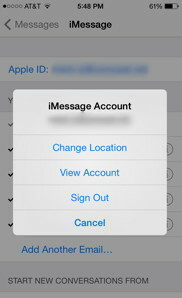 Do not sign in with your Apple ID in Settings -> Messages and do not turn on the iMessage slider on your iPhone. Doing so would re-associate your phone number with your Apple ID. Now, when someone with an iPhone sends a message to your phone number, the Messages app will not find an associated Apple ID and the message will be sent as an SMS text message through your cellular provider. Regular texting rates will apply. What If I No Longer Have My iPhone? If you decided to switch from an iPhone to some other brand of phone and you are not receiving text messages from iPhone users, it is likely you didn’t sign out of iMessage before you made the switch. In this situation, the messages from iPhone users are still being sent to your iMessage account, but you can only receive iMessages on an Apple device. To resolve the issue, go to https://selfsolve.apple.com/deregister-imessage and follow the instructions to deregister your phone number from iMessage. 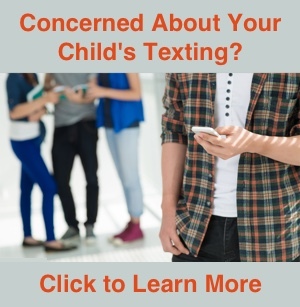 If you have additional questions about sending and receiving messages, please see my other articles discussing text messages and iMessages.